Relax and fly it as a glider from a bungee or slope. Electrify it with your preferred setup and fly it as a speed demon. It has a very wide speed range, great for thermal flying, excellent wind penetration on the slope, easy and smooth handling. Very aerobatic. 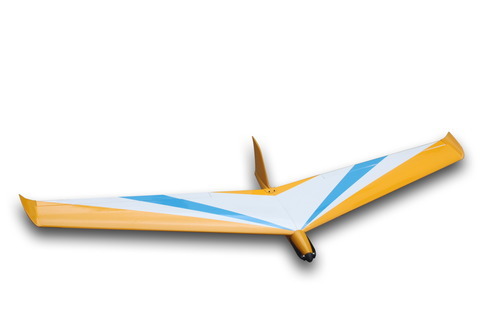 The flying wing features a light weight all moulded fuselage in striking yellow color. Winglets are moulded as well. Wings are balsa covered foam wings. Battery access is given through wing saddle. This flyer is a must have addition to everyone’s hangar. Assembly instructions in English with stage photos on CD, Fuselage, wing panels, tail plane and fin, clear canopy, small items, linkage hardware pack, decals set. Requires a 3 or 4-channel radio for ailerons, elevator, and throttle. Complete power package available, motor, controller, prop and batteries, inquiry for current pricing.